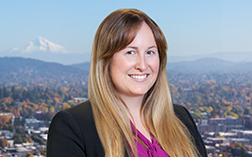 Kelsey Terry is an attorney in Betts, Patterson & Mines’ Portland office. Kelsey’s practice focuses on litigation and insurance matters, with a focus on products liability and construction defect litigation. Prior to joining Betts, Patterson & Mines, Kelsey worked at a reputable Pacific Northwest firm and served as regional defense counsel for a national retailer. Kelsey’s diverse litigation experience includes defending businesses and individuals against a variety of personal injury and property damage lawsuits, ranging from premises liability to wrongful death. During law school, Kelsey worked at the Television Academy Foundation and interned at an entertainment law firm in Los Angeles, California.